YouTube is a video sharing website intended for uploading and sharing videos. There are numerous member uploaded videos found on YouTube. You can enjoy movie trailers, tutorials, guides, personal videos and a lot more on YouTube. YouTube will not officially gives you download link for videos but you can download YouTube videos by using some tools on the net. Should you are a Firefox user you’ll then download YouTube videos by using a Firefox plugin called 1 Click Youtube Video Download. Go to Tools > Add-ons> Get Add-ons. Search for 1 Click Youtube Video Download Firefox Add-on. Select Add to Firefox button. Install the addon and restart Firefox browser. Then go to YouTube and open any video page you intend to download. You will observe a download link on the bottom right side of the video. Select any one of the three available formats FLV, MP4 and 3GP. Your download will begin after clicking on the icon. 1. Download YouTube videos in one click. 4. You can Download YouTube videos from the search results of Google, Yahoo and Bing. There’s an easy tool known as YouTube Downloader HD through which you can download YouTube videos without any plugin. 1) Visit YouTube Video Downloader HD official website. 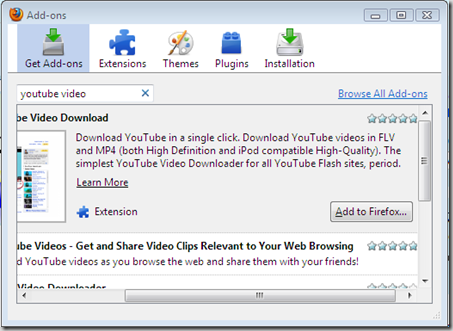 2) Download Youtube Video Downloader HD software (2 MB) on your PC. 3) Set up the software on your pc. 5) Copy any video URL from your web browser and paste to Youtube Downloader HD. 6) Paste the code in Video URL box given. 7) Browse the right location to save the video and then click Start button. Video will start downloading. 1) Download video with no browser addon. 2) Download High Definition (HD) videos. 3) Unicode support: Youtube Downloader HD can save movies where names have non-standard characters (like Chinese, Japanese, Cyrillic, etc. 4) Convert downloaded video to varied formats.